Spring bear hunting in the Rockies, Idaho specifically; probably the only thing that comes close is a bugling bull elk in September. Think about it. You have spent all winter watching it snow, reading all the latest bear hunting magazines, watched bear hunting shows, been to sporting shows, survived Christmas (probably getting some new hunting gear) and finally, slowly and oh so painfully spring finally arrives. The snow line starts to inch uphill, the earliest of spring wildflowers begin to blossom, rivers start to swell and the black bear begins to rise from his long winter nap. What better time to be in the woods, to cure that cabin fever and maybe try out some of that new hunting gear? Our spring bear hunting season begins as soon as we can manage to get to our trailhead and ford the river to begin setting bear baits. Once across the river we also want to get our camp set up as rapidly as possible because as the days warm the river begins to rise and crossing back and forth can get mighty exciting…if not downright scary! Spring bear hunting in Idaho is possibly one of my favorite activities. I truly look forward to checking the bear baits and looking at the trail cameras and seeing what we have visiting the bear bait sites. Planning where to place a blind, how to approach the bear bait or the blind, seeing the young elk and moose calves and deer fawns are all part of the cure for cabin fever brought on by a long cold winter. Your Idaho spring bear hunt will begin with an exciting and hopefully uneventful river crossing to get into base camp and after you settle into your luxury suite (also known as a wall tent) that will serve as your new Idaho home for a week, we will feed you, give you a short orientation and try to get you right out on an active bear bait site. Sitting still at a bear bait site will probably be the toughest part of your Idaho bear hunt but, you will want to hold at the site until right up to last shooting light then head out of the woods to meet your guide at a predetermined spot arriving well after dark. On Idaho spring bear hunts you will be able to sleep in and lollygag or fish (depending on the season and river conditions) for most of the day and then head out to your bear bait site for an evening hunt. Depending on the situation you may want to accompany the guides as they re-bate other sites and check cameras for those opportunistic omnivores. Depending on what you and the guide find you may choose to move to another bear bait site or possibly even try an early morning sit on a bear bait site. All meals are provided and should be able to satisfy even the most voracious of appetites. Lunch fixens will be available for you to customize a lunch sack to your own personal taste. So if you have a bad case of the yips or some good old fashioned cabin fever, give us a call or shoot us an email and see if we might have the right “medicine” for you, an Idaho spring bear could be just what the doctor orders. 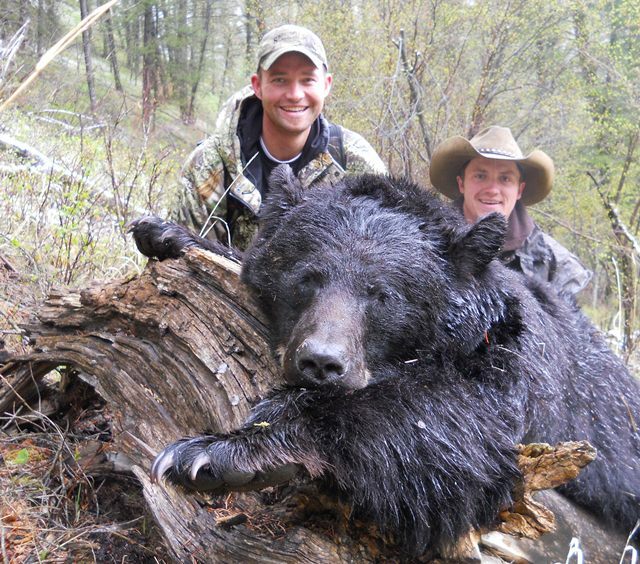 To help make an Idaho spring bear hunt with Wild Idaho Outfitters even more appealing, we offer a “Fallback” guarantee, which simply means if we can’t get you an opportunity at an Idaho spring bear, we will invite you back to try again in the fall of the same year for 50% off the fall bear hunt price. You already have the Idaho license and tags; why not give it another try? If you’re too busy in the spring for a bear hunt because you are chasing turkey’s, fishing for steelheads or simply just buried with a honey-do list too long to complete before the spring bear hunting season ends, you may want to give a fall bear hunt a try. Our fall Idaho bear hunting season opens August 30th in Idaho and we are lucky enough to outfit in an area that allows for 2 bears and at a reduced Idaho nonresident price. Our fall bear hunt usually takes place at our higher camp that we can drive into and much like the spring bear hunt, you can sleep in and rest or get up early and be on a bear bait before daylight. Fall bear hunting is over bait and we are able to drive to the jump off point for each of our bear bait sites and most are a short walk in off the road. 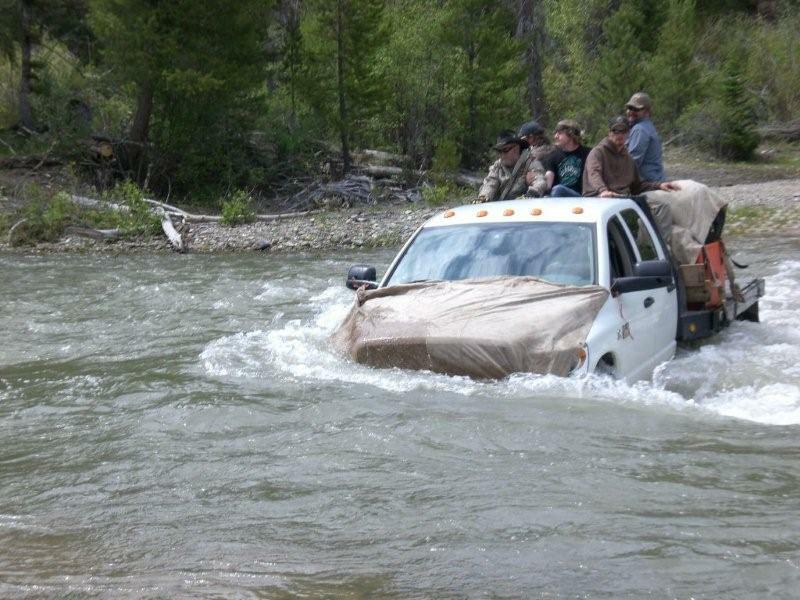 Our Idaho Fall bear hunts are 5 days and operate out of wall tents as well. Contact us today and let’s get you lined out on your backcountry Idaho spring or fall black bear hunt. Bring your friends and kids.